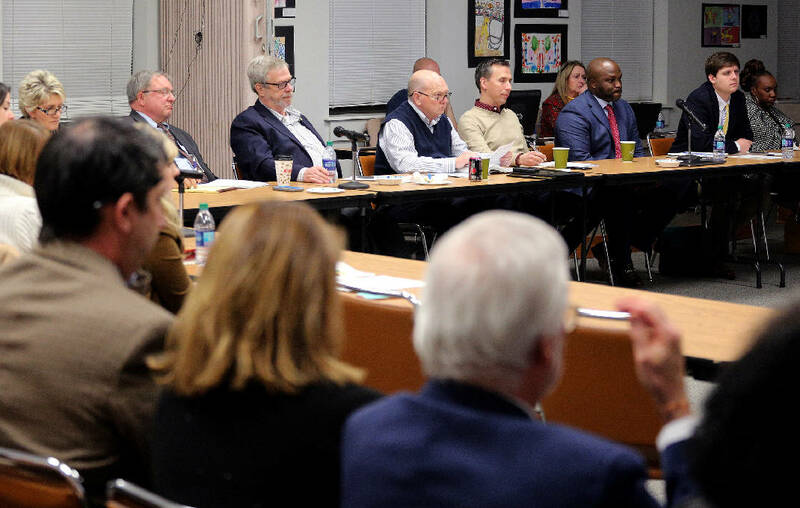 Hamilton County School Board and Hamilton County Commissioners wrap around a table at the Hamilton County Board of Education during a joint meeting Monday, January 14, 2019 in Chattanooga, Tennessee. Hamilton County commissioners had few questions for the county's school board and Superintendent Bryan Johnson at a joint meeting Monday. The meeting, which school board members and commissioners characterized as the first step in the budgeting process, included a review of the district's new five-year strategic plan and the Johnson administration's priorities. "As we go into the budget process we should at least have a much better knowledge base," said District 2 Commissioner and former school board member Chip Baker. "That doesn't mean there won't be more questions, but we'll have a good knowledge base. It's a great direction." Johnson highlighted some areas of growth and improvement the district has seen in the year and a half of his leadership, including the expansion of school options for students including open enrollment schools and Future Ready Institutes; intentional focus on organizing and streamlining district operations, and work to create a 10-year capital plan. The superintendent also acknowledged obstacles, including poor student achievement and outdated facilities. "Every day presents a new set of challenges in a school district of this size," Johnson told commissioners. Though student performance has improved across the district, especially the number of third graders reading on grade level, it could be better. "Hamilton County Schools, from an achievement data standpoint, should be outpacing the state, there's no reason why it isn't," he said. "Candidly speaking, it has not outpaced the state for the last decade." School board members, including Distract 4 representative Tiffanie Robinson and District 8 representative Tucker McClendon, also hoped the commission will get behind further investment in the district's capital needs. "I definitely hope that they will take our 10-year facilities plan very seriously and that they will hopefully support us in implementing it," Robinson said. Last year the commission committed $110 million in bond funds for capital projects, but Johnson noted that in a district with nearly 80 school campuses, the needs are much greater. District 5 Commissioner Katherlyn Geter was particularly interested in the schools' approach to early childhood education. "People who know me know that early childhood education is very important. When we talk about post-secondary and future ready, that really starts with early childhood," Geter said. Her counterpart, school board member Karitsa Mosley Jones, agreed on the need to start learning early. And both noted that, though the district is focused on workforce development and preparing students for college and careers, a student who cannot read in elementary school might never get to that point. Funding for early childhood education and school counselors, competitive compensation for teachers and other points are included in the school board's legislative priorities to be voted on Thursday. The board also will present these priorities to the county's state delegation at a joint meeting today. The need for additional money wasn't directly addressed Monday, and neither Johnson nor several school board members would say whether it will come up at budget time. When asked by the Times Free Press about the possibility of a request for more funding, Johnson and several board members declined to directly answer. Johnson did say he hopes budget talks will look at students' access to opportunities and appropriate compensation for teachers and leaders.